BETSY COLBY PHOTO | Bob Harris, standing, looking at Peter Zahn in the water after a crash. The Menantic Yacht Club (MYC) held it sixth series of Sunfish races In West Neck Harbor on Sunday. To our great relief, the weather was perfect, despite rain all that morning and dire predictions of thunderstorms. By the time of the race, strong winds were all that was left of the storms, blowing from the west at 6 to 12 knots. The Race Committee held six races instead of the usual five. The first was around the triangle plus windward, leeward, finish. The other five races were just around the triangle. As a direct result of Steve’s clear discussion, I witnessed many more 360 penalty turns being completed than in the past during this week’s races. Yours truly completed a turn when I tacked in front of a starboard boat and failed to leave enough room. For those of you who did not make Steve’s lecture, here’s a brief summary: Steve explained that the status of the committee boat (CB) as an obstruction changes. 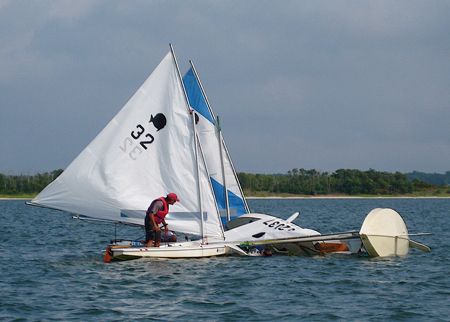 Prior to racing, it is an obstruction; once the race starts, the CB is like any other mark and is not deemed an obstruction, with the exception that a sailor cannot damage it without penalty. The leeward boat is allowed to force the windward boat into the CB, provided that in so doing the leeward boat cannot cause the windward boat to damage the CB; otherwise the leeward boat can be penalized. The windward boat would also be in the wrong by not being able to maneuver out of the way. Basically, if a sailor is leeward of the CB, do not even think about squeezing in. As far as barging is concerned, even if you are on starboard tack, you cannot interfere with a boat luffing at the line. On “room at the mark,” if you are the outside boat, make sure that you give all boats that have over-lapped you at the three-boat length mark room to go inside of you, including letting their boom swing out. Twenty-five sailors on 23 boats participated on Sunday. John and Marnie Colby shared a boat with Cole Colby solo on his own boat. Cole, I bet that grin on your face was because of your hole-in-one during the senior-junior competition at the Gardiner’s Bay golf tournament earlier in the week. Congratulations! Dave Olsen and newcomer Vangelis Aposto shared a boat after the boat, Vangelis, he was going to use broke a part. Welcome back Tom Ricketts, Bill Martens’ son-in-law. Also this week, we had some serious competition with the return of Steve and Melissa Shepstone, Jim Kohler and Chris Lane, Peter’s son. Steve and Melissa have won championship races. Chris has been performing exceptionally well in the Shelter Island Yacht Club races and he did really well on Sunday as the results indicate. Melissa had three first-place finishes; Jim Kohler had two; and Chris had one. However, Chris was consistent and took overall first place even though he had to repair a broken block on his spar. Way to go! Melissa is such a pro that even after taking a DNF early in a race she still ended up only 10 points behind Chris to finish in fourth place. Jim Kohler missed the first two races and still came in seventh. The starts were exciting in the windy conditions. Besides Melissa, a number of other boats were over early, including me, twice. One has to be vigilant and not let a sailor come up leeward of your position on the start line or the leeward boat will force the windward boat over the line early. Just remember to try and get clean air at the start. There were a number of crashes and flips. Not all of the flips were due to the crashes, just the strong winds. Michael Becker put his mast into the bottom muck. Other flippees were Penny Pilkington while rounding a mark and Peter Zahn right at the finish. He collided with me and another racer. Luckily we were over the line at the time. I am sure that dipping in the water felt good because it was a hot and humid day. The Race Committee consisting of Commodore and Sallie Bethge, Betsy Colby and Melanie Coronetz did their usual superb job. Debbie Davison and Penny Zahn helped out in the stake boat, moving marks as needed. There was no cookout this week but there will be one next week at the home of Tom McMahon and Linda Gibbs. If you’re planning to come, please let Commodore Bethge know how many people you’ll be bringing. A $5 per person donation is suggested to go toward food costs. The MYC meets every Sunday afternoon at 2 p.m. in West Neck Harbor. Whether you are a novice or expert, come join in the fun and competition. All sailors are welcome. We have extra Sunfish available on a first-to-reserve basis. Call Pete Bethge at 749-1297 or Bob Harris at 749-0524 to reserve a boat or ask questions. If anyone wants to donate a Sunfish in good condition to the fleet, please feel free. See you on the water. 1 point for first place, 2 for 2nd, etc.